The Smart Museum of Art in Hyde Park has dedicated its entire space to a sculpture exhibit that spans the eras from ancient to contemporary. Carved, Cast, Crumpled: Sculpture All Ways is well displayed and organized by historical era. There are works by modern masters like August Rodin, Jacques Lipschitz and Henry Moore, Asian religious figures, classic European bronzes, and neon, metal and fabric sculptures from the modern era. My slideshow will give you a quick overview of the diversity of the exhibit, which is open through December 21. Why do I love street art? I’m particularly fond of it because it takes art out of the elite realm and puts it out for everyone to enjoy. No admission fee, no checking your bag, no waiting in line. I also like it because it is part of the cycle of people’s art that encompasses comic books and graphic novels, pop art, the Chicago Imagists and the Hairy Who, and today’s post-street art. Banksy is the famous and elusive British street artist who produced the delightful 2010 documentary, Exit Through the Gift Shop. In October 2013, Banksy took up a “residency” in New York. Every day of the month, he installed a piece of street art somewhere in New York and started a frenzy of art lovers and hipsters seeking out each day’s work. Banksy would post a tease on his website each morning, suggesting something about the art, but not identifying the location. HBO Documentaries has produced a 90-minute film, directed by Chris Moukarbel, about this month of street art adventures, titled Banksy Does New York. It’s been running on HBO channels and it’s available on HBO on demand as well. The installations are varied in form, materials and message. 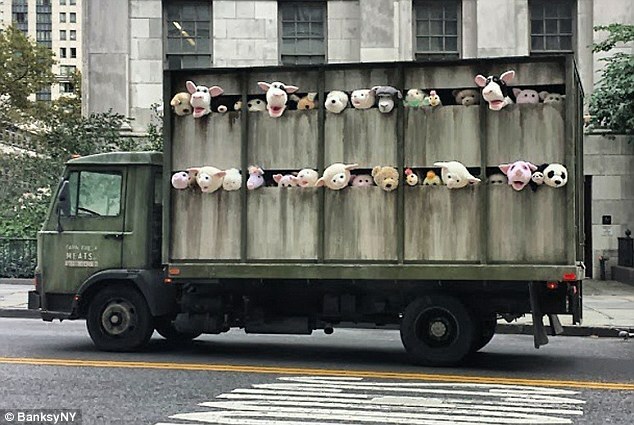 They range from stenciled figures and balloons to a crumbling sphinx to a slaughterhouse truck filled with squealing animal puppets that parked in front of various meat markets throughout the day. National Gallery is a Frederick Wiseman documentary profile of London’s National Gallery. It’s running through December 4 at the Gene Siskel Film Center and although it’s almost three hours long, I highly recommend it. It’s a magnificent look at this immense art museum and its visitors, staff members and, most of all, its collection. There’s no narrative voiceover, no background music, just the museum and its denizens—and sometimes silence. The trailer will give you an idea of its charm. As I said in my Gapers Block review, my favorite aspect of the film is the faces. Faces looking at faces. All manner of expression in the visitors and all manner of people portrayed on the walls.